Picplz is a one of the best app made for Android and iPhone devices to share your life through photos. Picplz lets you style your photos with free photo effects and quickly share them with your friends and followers. You can use picplz to share photos on your favorite blog, Twitter, or Facebook. The photo-sharing services like Twitpic and Yfrog that can quickly share photos on social media are numerous. However, a newcomer Picplz attempts to renew the genre. 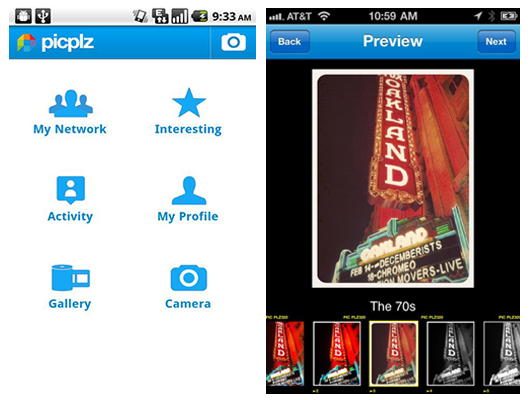 You can share all your photos with your friends and social sites from your iPhone or Android device. You can not upload photos from the website of this service. In addition to the photo, the location data will also be sent to Picplz. This allows to search for photos by location. 1. 100% FREE photo filters. 2. Style your pics with filters to give your photos vintage 70s, Monochrome black & white, Hipstamatic Russian toy camera, cross processing, and instant film effects and more. 6. Seamless & FAST uploading. You can also add a message to accompany the photo. If you wish, you can push your photo and message on Twitter, Facebook and do a check-in on Foursquare. Specially I like the simplicity and speed for this app. Interesting to see if there is room for a service that offers a new way of sharing photos from a smartphone.Picplz is available for both Android and iPhone devices. You can download Picplz app from the following download link.